This striped tee is a classic wardrobe staple. Carru it off with confidence on any jeans, khakis or trousers. Giving you that taller slimmer look, stripes are cool for all occasions. Go ahead, stripe it up ! 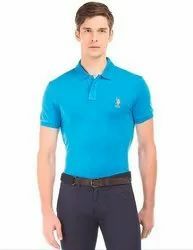 The Reebok F Pique polo for men crafted with Cotton which ensures supreme comfort while it comes with ribbed cuffs and side slits at the bottom. It supports a Reebok Starcrest logo embroidered on the front left. Get a chiseled look wearing this suave checkered polo T-shirt by Turtle. The subtle orange and maroon checks on structured blue base look absolutely trendy. It comes with ribbed collar which completes the classic look.